I am the current owner of Loki. 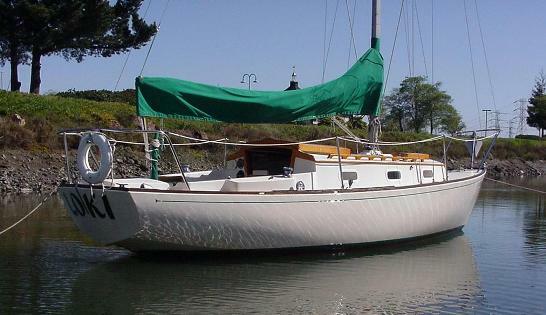 I have had her for about 4 years and I sail her regularly here in San Francisco Bay. Luv the Loki however I'm putting her up for sale. How do I make a listing on your website? This is the history we had on Loki up to this point. Rick and Brenda Warren acquired Loki as part of an insurance settlement in 2003. She had been involved in a major T-bone collision. Rick has been restoring her. 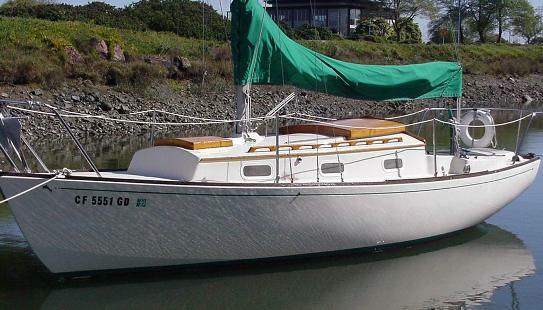 Here she is at Point Cove Marina on the south end of San Francisco Bay back when she was owned by Ray Story. My name is Ray Story. I have owned "LOKI" Pacific Dolphin #277 since December 1990. I met the, or one of the, owners of the Pacific Dolphin Company July 4th 1991. We were getting ready to watch fireworks when a fellow hailed "Hello Loki". I answered and asked him if he knew the boat. He said he used to own the company! It seemed that Loki was used for display at the boat shows. Fitted with teak hatches and slats on cockpit sole, green and white sail cover, she must have been quite the crowd pleaser. Anyway, the sales manager took Loki on the boat show tour, took a few down payments, and left the boat in the parking lot of the last boat show. And that, said the fellow I just met, was the end of the Pacific Dolphin Company. Evidently these guys were suppliers to Yankee Yachts, and when Yankee went bust they ended up with the molds for the 24 and the 30. They never made a 30 as the molds had been modified so many times they were in pretty bad shape. There are quite a few Dolphins on the Bay, two in our harbor. A couple of years ago a Dolphin won (on corrected time) the cruising class of the Pacific Cup, S.F. to Hawaii. Finished last, corrected to first. Bless that 264 rating. BEAUTIFUL BOAT W/ NEW SAILS, RETRACTABLE KEEL, [trailerable] HAULED-OUT AND PAINTED [HULL ONLY] SEP.08 PAINTED INSIDE NOV.08 2 BEAUTIFUL TEAK HATCHES. ALL BRIGHT WORK DONE. WITH EXCEPTION OF A FEW PIECES. NEW CUSHIONS AND MORE. THE BOAT IS 90% DONE SOME WORK REMAINS TO BE COMPLETED. IF YOU WANT TO COMPLETE WORK YOURSELF. WE CAN NEGOTIATE A PRICE. WE ARE ALSO INTERESTED IN TRADING FOR A LARGER BOAT. PLEASE CALL 415-306-2126-or-415-728-7338 OR EMAIL. I MAY BE OFF INTERNET FOR A FEW DAYS. 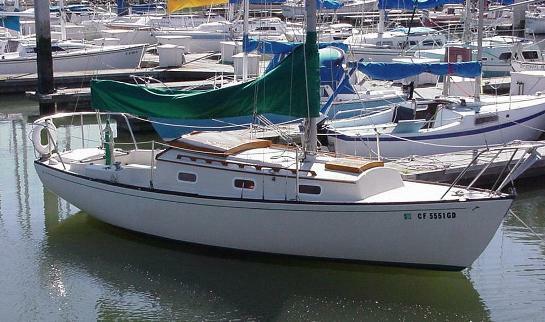 We got "LOKI" back in 2003 as a pay-off for some boat work we had done. "LOKI" was involved in a collision just outside the Golden Gate Bridge (I do believe) and was considered totaled by the insurance company. The boat was T-BONED on port side aft just forward of bulkhead. My husband and I spent much time and pride repairing the damage. ("He is a Genious at Fiberglass repairs") The blue book at the time was:$7,300 and this is what I based our price on. "THANK GOD SHE DIDN'T GET CRUSHED"!!!!!!! She is as good as ever. I'm going to continue to"BEAUTIFY HER". We love and appreciate the craftsmanship of this vessel. We just cannot afford 2 slip fees and need a larger boat for live aboard. We are willing to trade for a live aboard size boat. Anyone interested can email or call me personally. Well, "This has been fun" and "Thank You"
Thank you for checking back with me. YES, she is for sale and she is just about ready!!!! New paint in progress - top side and non-skid, new sails, 4 new ports, working head, many coats of varnish, 2 more coats will be applied next week. Please call 415-306-2126 or e-mail @ shebythebay@gmail.com. 99.9% should be done and ready to show by 9/1/2009. "please only serious buyers should inquire"